Chiryeon Valley is situated to the west of Dongeopryeong (a ridge), Mt. Deogyu. 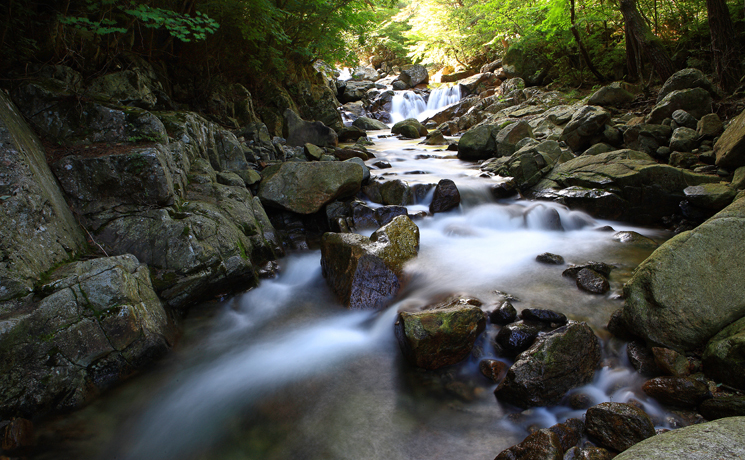 The clear, coldwater from the valley flows through the dense pine forests around, along with rare rocks to make such mystically beautiful views as Chiryeon Waterfall, Yongchu Waterfall, Myeongjeso, Mundokso, DosuIdam and flows on to Guryang-cheon(Guryang River). 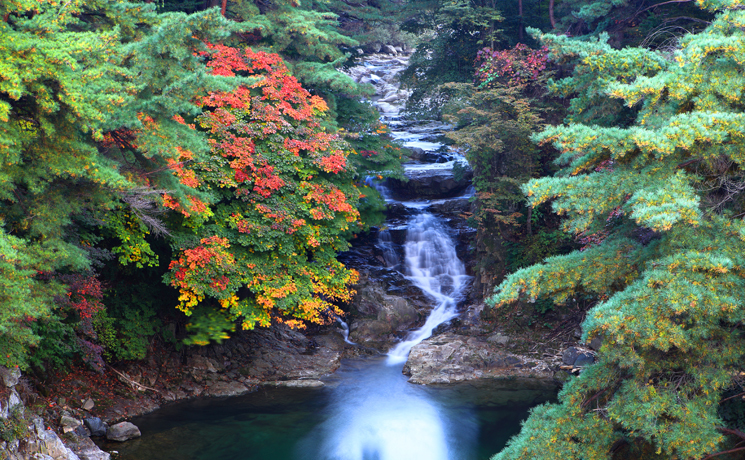 Chiryeon Valley was named after Chiryeon Waterfall because the waterfall is in the valley. There is Chiryeon-eui-chong (a tomb) where about 15O men of the righteous army fought against a Japanese force and died heroically in the last period of Joseon Dynasty. There is also Jeollabuk -do Center of Natural Enviroment to cultivate young people's magnanimous spirits toward nature. 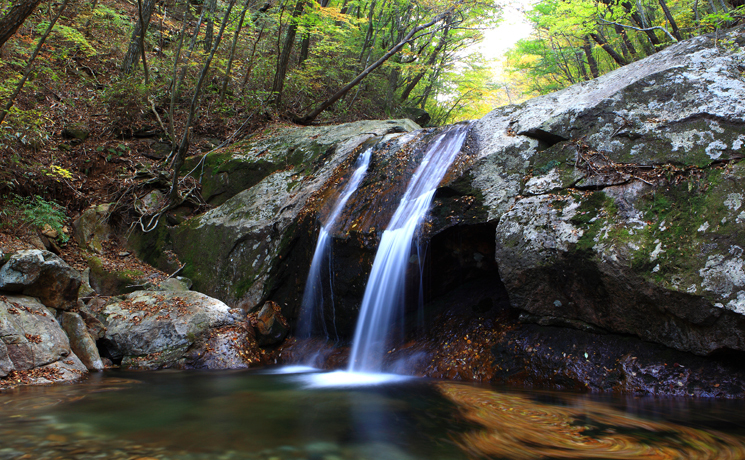 The water tumbling over the silky surface of rocks in the forests makes the seven pools. 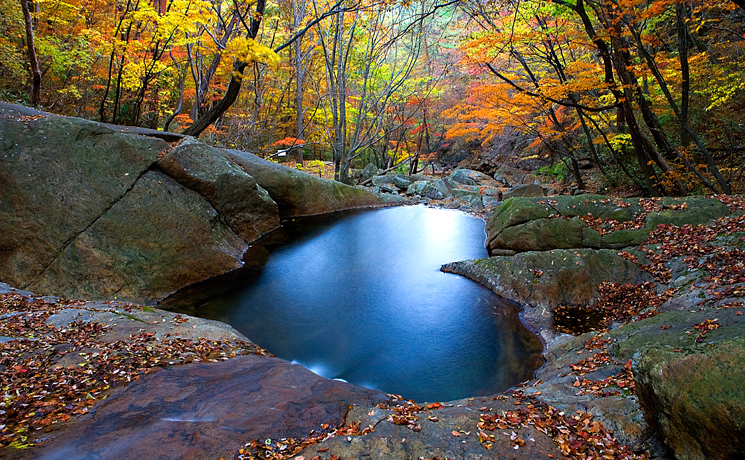 Those pools are lined up in a line and named Chiryeon (The seven pools). Jade-like clear water in the seven pools stays still for a while and repeats rolling and tumblmg to make seven beautiful waterfalIs Chiryeon Waterfall a well-known as a fairyland. The water is clear and cold even in summer. Lots of old pine trees and maple trees surround the waterfalls beautifully and there are large numbers of tourists every summer and fall. The water from Dosuldam in Chiryeon Valley flows through the old pine trees and tumbles down to Yongso (a water pool) along the rocky wall. They named it Cheonil (unique under heaven)Waterfall because they believe it is the most beautiful waterfall under the heaven. The waterfall tumbles down through the high rocky cliff from the top of Byeongpung (a folding screen). Rock which stands in the northern valley of Sanjeong Lake, Mt. Jeoksang.